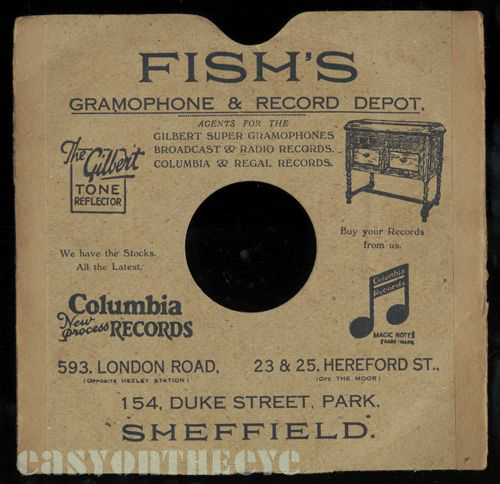 “Gramophone Supply Depot”. Hard to be certain if this is Church Street in the City Centre, or one of the suburbs. 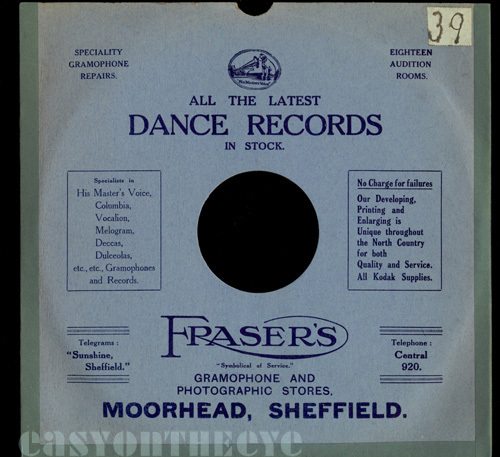 This seems to be an early shop judging by the 78 sleeve, which is actually a sample of The British Ideal Record Protector over-printed with the shop name. A later bag for the same address lists Dewhurst’s as simply The Gramophone Shop. Records and supplies. May have also been a trade supplier. (entry in Sheffield & District Trades Directory 1927-28, also listed in Manchester same year). No sleeve available. 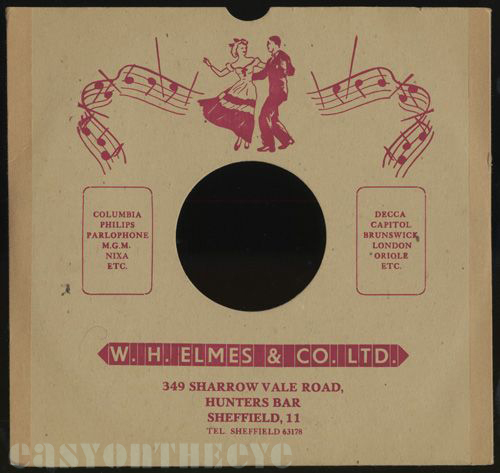 The sleeve graphics suggest a business going in the 1940s or early 1950s. The shop is now a frame makers, but the building retains much of it’s original look. 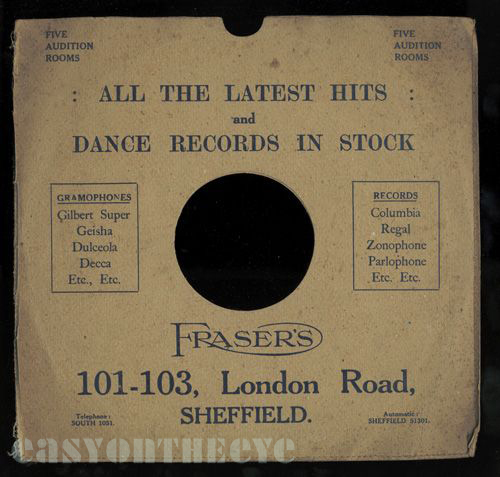 “Buy Your Records From Us We Have The Stocks!” An 8″ sleeve and the cabinet shown on it suggests a date of around 1925. The Hereford Street (W. Fish was a bootmaker at 23 Hereford Street in 1911) and Duke Street shops have been pulled down. The London Road shop was a confectioners in 1905, but Walter Fish was there until 1934, a “Wireless and cycle dealer” (London Gazette). The site is probably extant but the parade of shops are all now owned by Ponsfords. Foulde’s. F. 188 Northfield Road, Crookes. 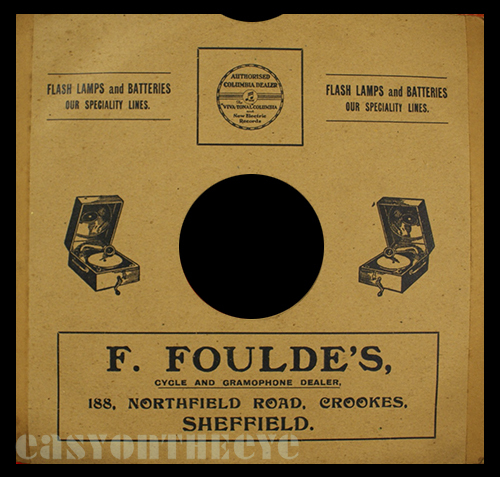 Cycle and Gramophone Dealer, Flash Lamps and Batteries Our Speciality Lines. The shop is now Little China takeaway. “All the latest hits and Dance Records in stock.”. They also advertised Five Audition Rooms. The modest shop still stands, albeit the front ruined by conversion to fast food outlets. It is currently empty. The shop moved and expanded to become a Gramophone and Photographic Stores, and now with eighteen Audition Rooms. This site has been redeveloped.